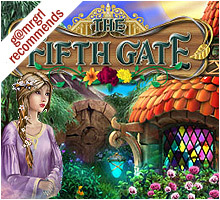 The Fifth Gate, a time-management game set in the realm of fairies, illustrates the timeless struggle between good and evil in deceptively ethereal surroundings. 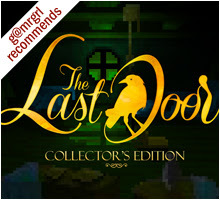 Eden, the game's young heroine and the realm's most gifted gardener, is abducted by malevolent sorceress Morgana, and forced to work as her assistant tending to her garden and fulfilling her requests for flowers, potions and money. 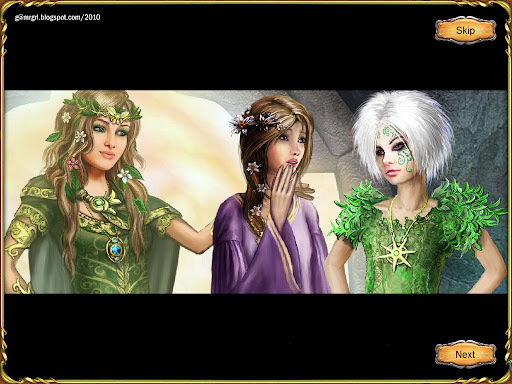 Though Eden soon learns of Morgana's plan to use the potions to capture the throne of fairy queen Titania, she is unable to escape the magically sealed gardens. Morgana, contrary to expectation, isn't an ungrateful taskmistress. Besides rewarding Eden's gardening achievements with suitable gifts, Morgana also acknowledges her desire to escape, and gives her gems that will open the five magical gates... as soon as the pressing matter of overthrowing Titania is concluded. 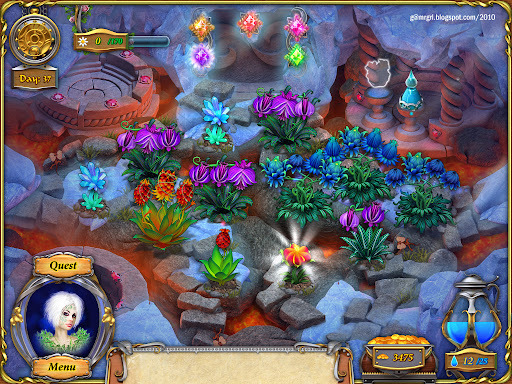 The concept is simple - plant saplings, water them, ward off pests, collect blooms, make potions, sell potions, complete Morgana's quests to earn gems, and eventually, open all the gates. 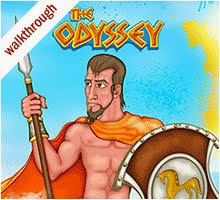 But the pace and complexity evolve steadily, and soon the game enthralls, challenging without resorting to unrealistic demands, or even feeling repetitive. 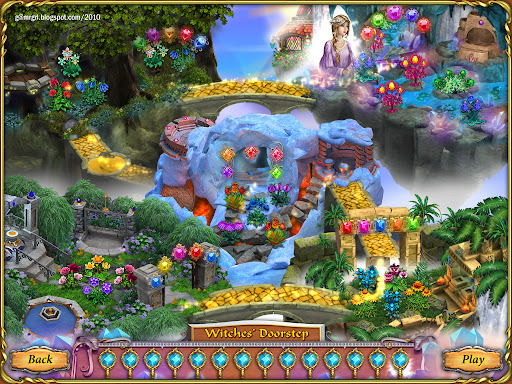 There are five gardens, with five gates, each of which requires five gems to open. Eden starts in the Primrose's Bower, then moves through the Garden of Sighs, the Garden of Fire & Ice and the Dell of Dusk's Dreaming to the Witch's Doorstep, the site of Titania's throne. Each garden boasts its own native flora and fauna based on its environment. This includes three unique plants, each of which can be upgraded thrice, yielding a whopping forty-five varieties of blooms over five gardens. There are fifteen different critters, three per garden, encompassing both the real and the mythical, from innocuous boring beetles, salamanders and bats, to poisonous stone golems, wasps and toads. 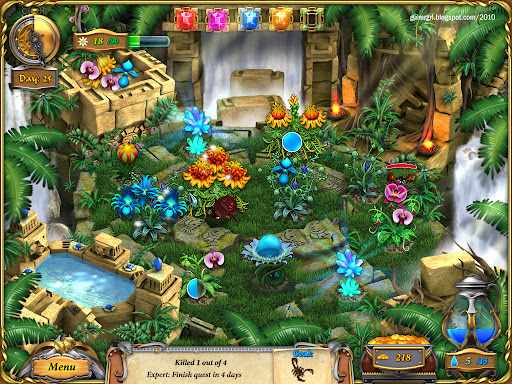 Each garden has fourteen levels, adding up to seventy rounds spanning multiple days for the game. 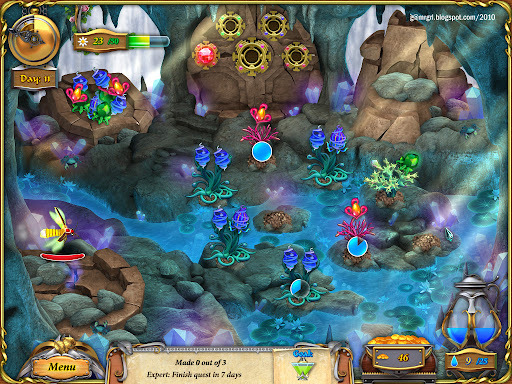 At the start of each level, Morgana specifies a quest for Eden, defining the amount of saplings, flowers, potions, cash, and sometimes even dead critters, that she wants, and the number of days in which to accomplish the quest (the Expert target). She rewards Eden's successes with new types of seeds, upgrades saplings to more exotic variants, and teaches her spells to help her manage the garden more efficiently. 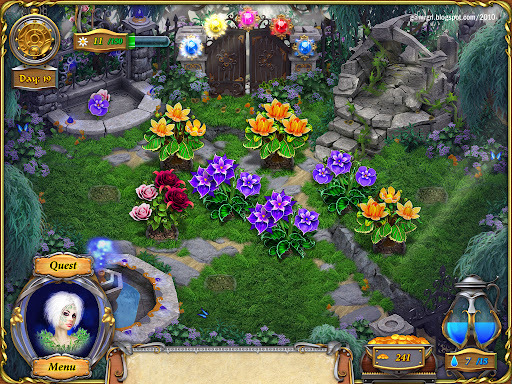 The harvested flowers are used to make potions. 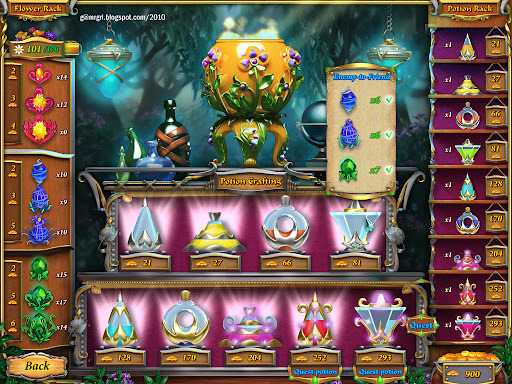 Eden can trade excess potions and flowers for money, used to upgrade facilities like the fountain, replenish exhausted spells, dig seedbeds, buy saplings, and fulfill Morgana's cash requests. Eden can also sell saplings and swat critters to boost her kitty. 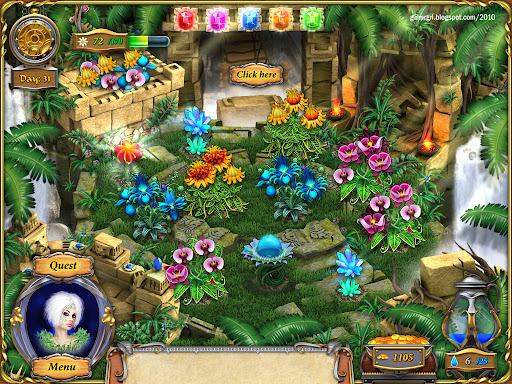 Introduced at the Garden of Sighs, 'helper plants' immediately move the game-play past mouse-pushing to strategic placement and use of resources. Of particular use are Dewdrop plants, which produce water, Pest Magnet plants, which freeze pests into ice-cubes, and Fertiliser plants, which force neighbouring plants to bloom. 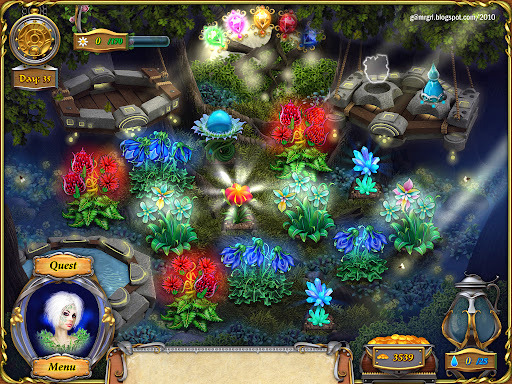 The Butterfly plant upgrades saplings, and at later levels, the Power plant enables collection of all flowers on a plant and killing pests with single clicks. In a moment of uncharacteristic generosity, Morgana shares her secret spells with Eden. 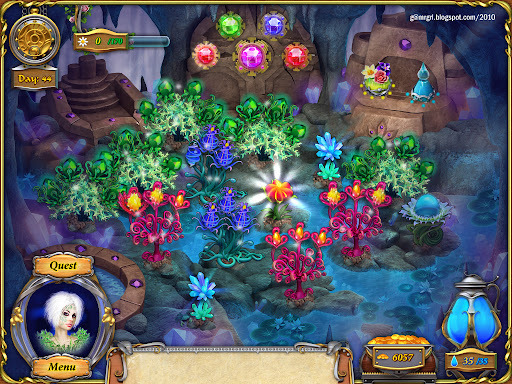 The invaluable Rain spell allows all plants to be watered at once, and the Harvest spell instantly gathers all blooms. The third spell, Pest Killing, eliminates all critters with one click. Each spell lasts for six uses and then must be recharged. My only gripe is that there's no indicator of how many uses are left, which results in frequent recharging before actual expiry to avoid 'running out of spell' during the game. The gamer is also awarded medals for reaching milestones such as numbers of potions made and critters killed, but this is of academic interest only in the absence of visible statistics. 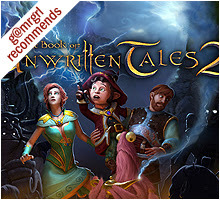 This is among the most visually attractive games of this genre. 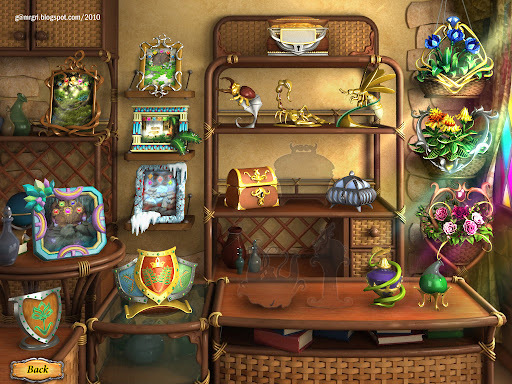 The art is intricate, and the delightfully 'mystical' scenes glow with vibrant colours, brilliant blooms, sparkling fountains and glossy potion jars. Some critters are cute, some not; all are menacing enough to cause panic when they appear en masse on screen. In comparison, the cut-scenes playing out the story are stilted and dull, with zooming static images of the three girls in and out as they 'talk' to each other. The hot spots are large and easily clickable even in a rush, thus all but eliminating wasted clicks (and stress). The text, in an elegant cursive, is straightforward and free of typos. Morgana's dialogues are quirky, often funny, and reveal her girlishness beneath her heinous scheming: for example when she asks Eden rhetorically why people don't like her, or requests a potion to help her net true love, and when that fails, yet another to mend her broken heart. The tutorials are easy to follow even for beginners. The music is extremely limited but adequate in mood and quality. The sound effects, while also limited, are well-suited to the scenarios. 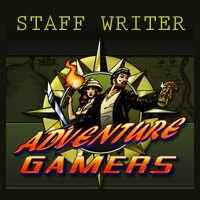 The Fifth Gate is a rare blend of a classic fantasy tale, action-packed game-play, and beautiful art. 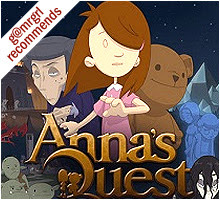 It's entertaining and challenging in equal measure, and leaves the gamer satisfied, yet craving for more. At the end, Morgana, scolded by Titania for being, of all things, lazy, leaves in a huff, but not before promising to return. That's a sequel worth waiting for.